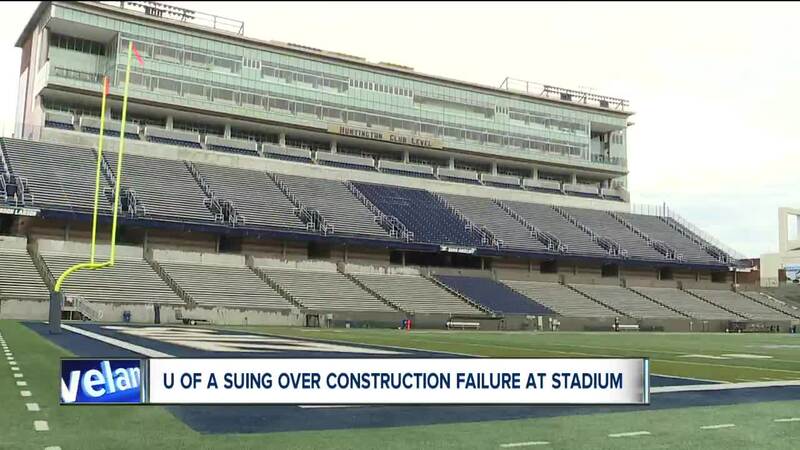 AKRON, Ohio — The University of Akron has filed a lawsuit for "catastrophic and consistent failure of the railing systems" at the stadium. The civil suit, filed in Summit Common Pleas Court, lists several defendants, including HNTB Ohio,Inc., Welty Building Company LTD, and Parsons Concrete Contractors Inc.
Several pictures that appeared to show collapsed or damaged railings and cracked concrete were including in the lawsuit. The University of Akron has filed a lawsuit for "catastrophic and consistent failure of the railing systems" at the stadium. Photo by: Bob Jones. HNTB provided the design and construction administration. Welty Building Company served as the construction manager. Parsons Concrete Contractors provided concrete work for the stadium, according to the court filing. The lawsuit claims poor design, failed oversight and construction deficiencies will cost the university $1 million to fix. The university said it "has been left on its own to spend and recover the $1 million repair cost." In an emailed statement, UA spokesman Wayne Hill said, "The court filing and photos detail the serious problems the University continues to face due to faulty construction of the railing system at InfoCision Stadium. We have tried to resolve this matter without filing a lawsuit, but, unfortunately, those efforts were unsuccessful." The stadium was built in 2009 and is owned by University of Akron, but considered a state entity since it's located on a public university. The lawsuit was submitted by Ohio Attorney General Dave Yost. The companies involved in the stadium construction have not responded to requests from News 5 for comment.